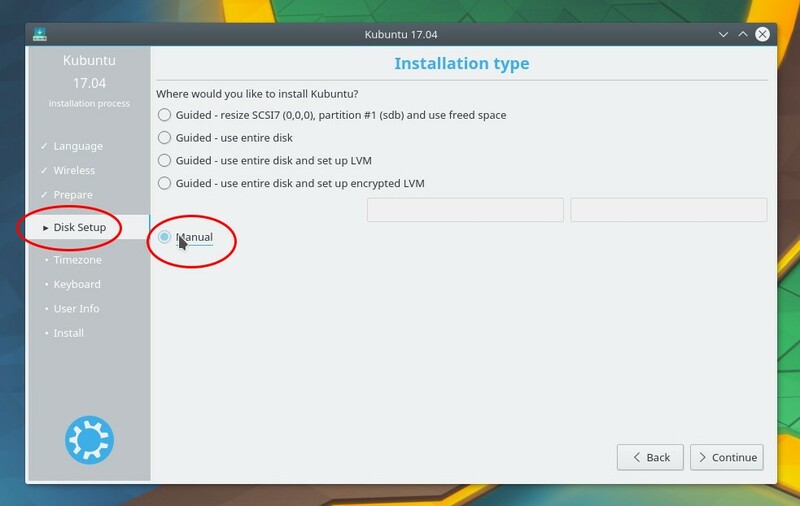 This tutorial guides you to install Kubuntu 17.04 operating system step-by-step. 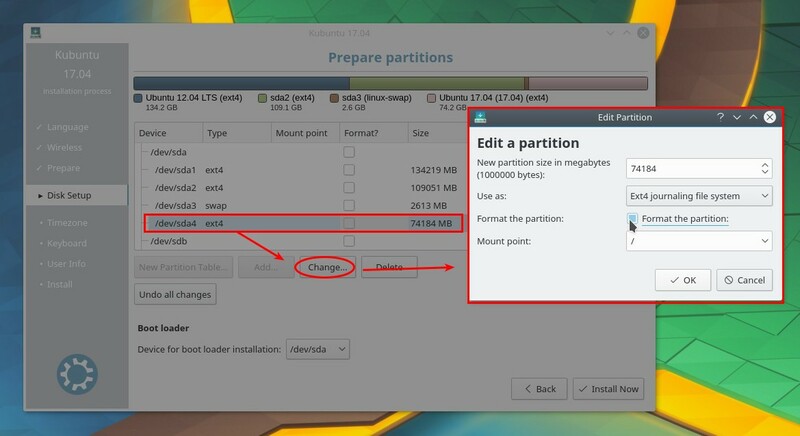 You'll prepare a main partition, a swap partition, and do installation steps using a bootable USB drive. Kubuntu can be installed on PC and laptop, and this tutorial is applicable for both. 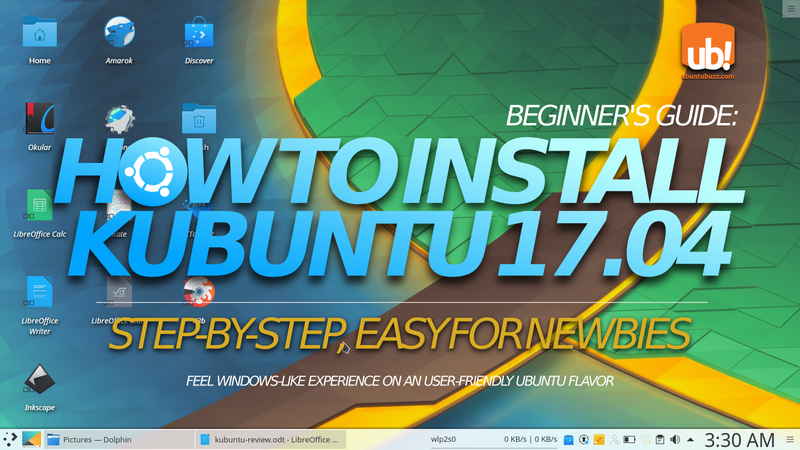 It's easy and I hope you'll enjoy the beautiful Kubuntu 17.04 soon! 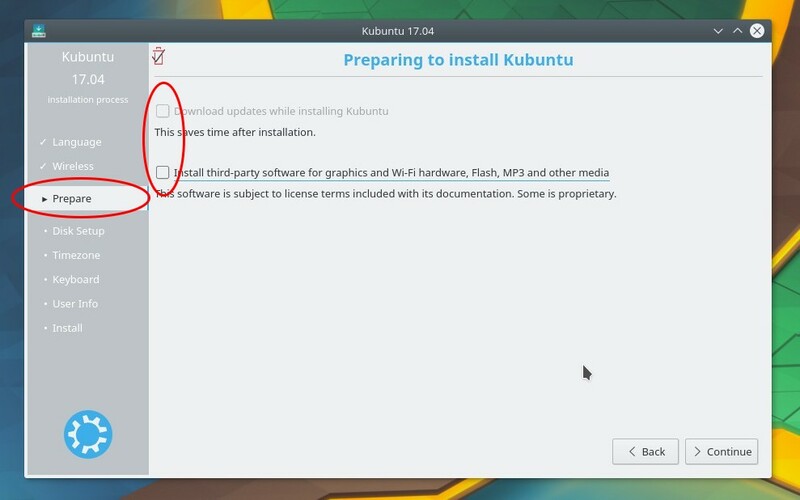 Note: this article is about installing Kubuntu 17.04. If you're looking for review, it's available here. Get Kubuntu 17.04: download the ISO image from this list of links. You can cut down your bandwidth cost by downloading via zsync. Two partitions: prepare 2 blank partitions, one at least 20GB for main partition, and another one at least 1GB for swap partition. Preparing partitions before installing is best for most users. Installation media: burn the image into a USB flash drive. You can use tool like Disk Utility (Ubuntu built-in) or Unetbootin (available for Windows & GNU/Linux). Read the tutorial for Disk Utility or Unetbootin. If you don't have any USB drive, just burn it into a DVD instead. Be careful: make backup for your important data, don't be sleepy, and read every step carefully. Please understand that you do the installation at your own risk. Plug your USB drive in and boot your computer into USB. While entering Kubuntu 17.04 desktop screen, run "Install Kubuntu" icon on desktop. First step: choose your language. 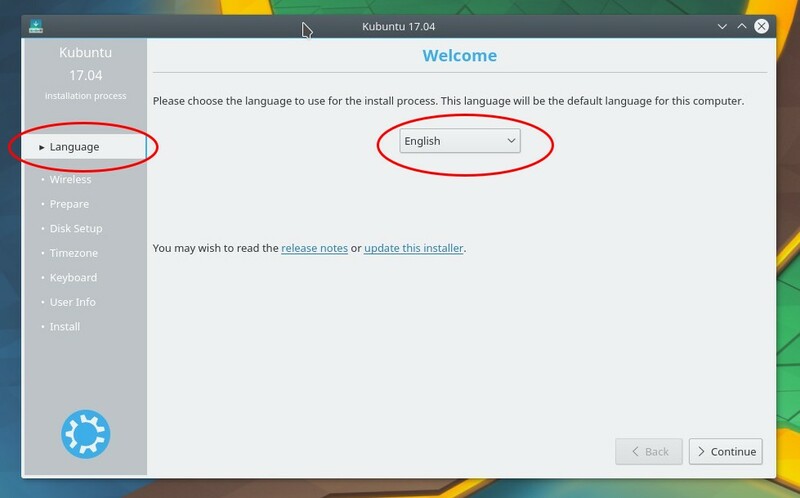 This choice will be the default user interface language of Kubuntu. Second step: choose "I don't want to connect..." so installation can finish faster. 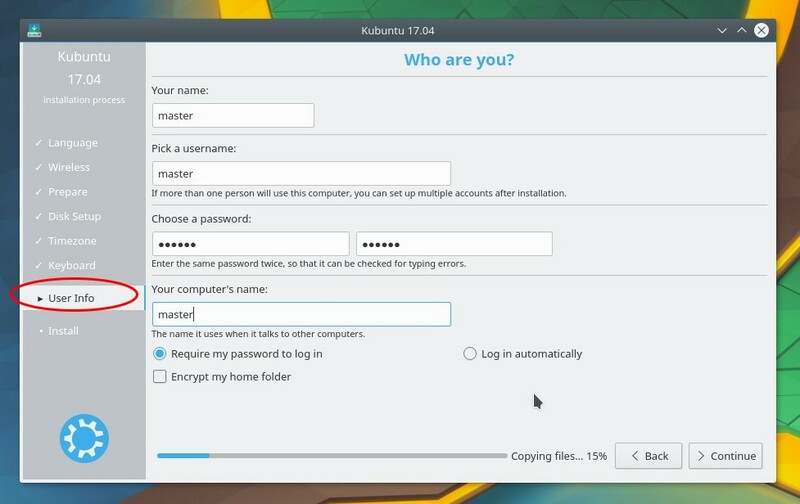 Third step: blank the choices of downloading any program while Kubuntu installing. This also makes installation faster. Fourth step: choose Manual for disk setup. 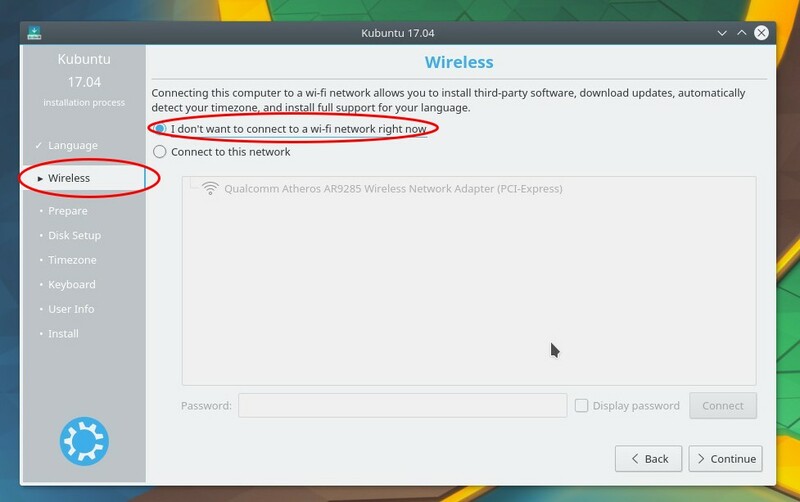 This choice is equal to "Something Else" on Ubuntu installation. then press OK > wait until main partition prepared. 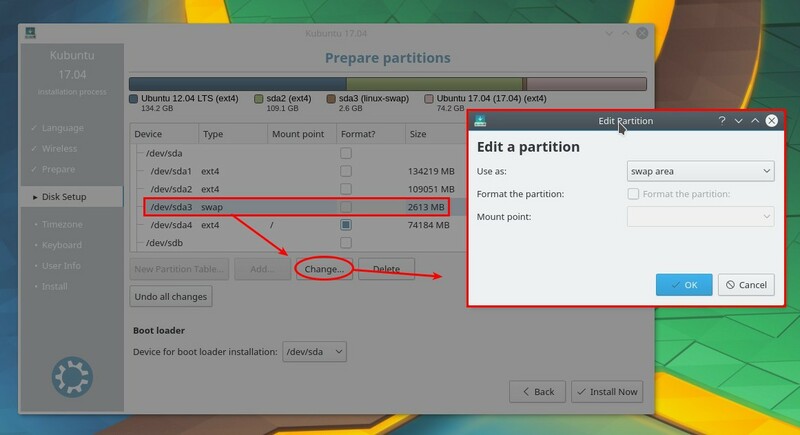 Sixth step: still on Prepare Partitions screen, choose the smaller blank partition you've prepared > press Change > set Use as: swap area > OK. Now you have two partitions for Kubuntu: main and swap. Seventh step: still on Prepare Partitions screen, at Boot Loader section below, choose the disk location where your main partition belongs. For example, my main partition is /dev/sda4 so the disk for bootloader should be /dev/sda. Eighth step: please re-read all settings you've conducted, and if you are sure, press Install Now to proceed to the actual installation. After pressing this you cannot go back. 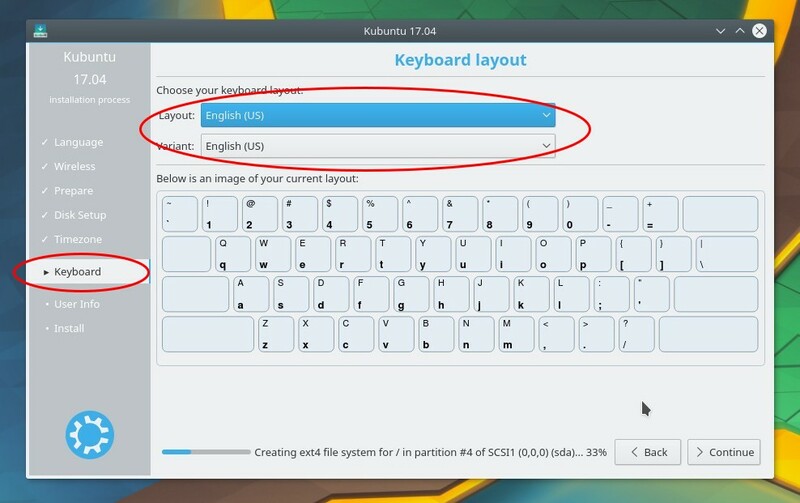 Ninth step: while installation is progressing, Kubuntu installer asks you for your geolocation, keyboard layout, and desired username. Geolocation: choose where you live. 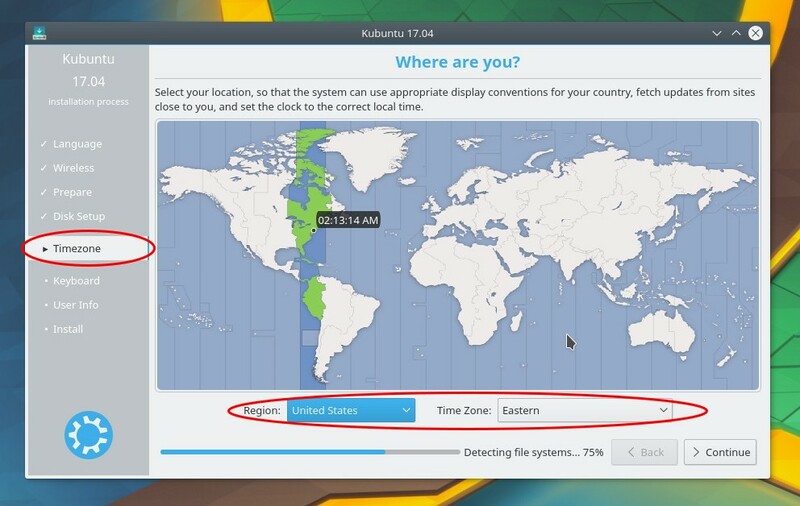 This determines Kubuntu system timezone, currency, and local formats/units. Keyboard layout: choose your preferred keyboard layout. While the default option is safe for most users, there are available Japanese, Chinese, and Greek options. Username: now create your username and password here. You can also choose to login automatically (enter desktop without password) or not. 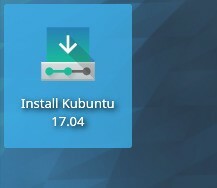 Kubuntu 17.04 installation takes around 10 minutes only. Once finished, it asks you to continue testing (stay on live session, e.g. to copy some screenshots) or restart. Enjoy Kubuntu!